Not because I can’t. I can now (and so can you), through Makeup Masala who offers international shipping. 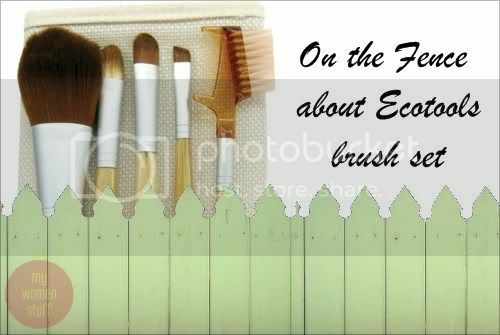 I must admit that much of my “obsession” with the Ecotools brush set has to do with curiousity. Because we cannot get it here in Malaysia and before this, it was hard to get due to lack of sites offering international shipping, I wanted it. It was also because everyone I knew who had it said it was SO GOOD! But recently, I had the chance to see and touch the set in person thanks to PrettyBeautiful who let me paw at her set, and immediately, I lost all interest in it! The brushes are lovely and soft, make no mistake. The bamboo handles are lovely to hold and the whole set looks good for the price you pay (US$10 in the USA or $12.95 on Makeup Masala) but on a personal note, I found the blush brush a little too soft – I like soft brushes but I prefer something just a touch firmer for blushes. It might make a good powder brush though. The only brush that looked promising to me was the eyeliner brush. It looks very much like my angled eyeliner brush from my Tony & Tina set and the MomoMinerals set, so that took care of any “wants” on my part. PREVIOUS POST: Presenting Sephora Hong Kong! NEXT POST: Stila Says: Goodbye Malaysia! I bought this when I was in US last month and found the quality to be great. However, hving said that, do go for the individual ones if u dun need an entire set. I’ve tried both the blush brush in the set and the one sold individually and the individual brush feels a tad fuller as compared to the one in the set. It looks like the single brushes are the way to go! I might try the blush brush – I am always on the hunt for a good one. Does it feel denser than the one in the set? I’m not in love with them but they’re pretty damn good for that price.I’m a closet-greenie and I love the pro-green of the set. WRT the blush brush, I found that it’s too damn big for my cheeks so I’m actually using that as a powder brush for times when I actually do fluff some powder onto my skin. I got a small angled brush which sheds like mad so it’s a complete female dog to use and pick the strays off my cheeks. I’m still trying to get a good budget blush brush which doesn’t shed. Hmm…very funny cos I was also searching for it high and low and when I saw it on Makeup Masala, I decided not to buy too! wasted money i guess. but they are good for travelling, in need of one since i dun have any! Aww… I don’t think they are a waste of money. You can always use it for travel as you say. I do agree with the curiosity bit! I like my mineral set very much for traveling. They’re soft and small enough. But if I’m doing my makeup at home, they won’t be the ones that I’d reach for since I have other brushes that are better in terms of size, density and function. no doubt about eco-tool’s quality. I think these would be good starter kit for people who don’t own many brushes. Thanks for the feedback with the Ecotools set. I suppose its good for a starter set as you say or for travel and you can’t beat the price! I don’t own the brush set but I’ve the individual ones for blush and foundation. The foundation brush is so soft and fluffy. It’s my favourite! The blush brush is soft and picks up the colour nicely but I still prefer using my MAC 187 and 168 for blushes. I suppose the Ecotools are brushes that will do at a pinch but there are better ones out there eh? I own the brush set and the only brush i use on every day basis is the blush brush. i really think this is a great blush/ powder brush. i think it picks up just the right amount of blush and so make it really look natural on the face. i use this with MAC Grand Duo blush as well and i find it’s less shimmery that way (these blushes are really shimmery btw). the other brushes in the set are just okay and not a must get in my opinion.